PORT LOUIS - The concerns and allegations raised against Athletics Kenya, AK, are very serious and need to be addressed, according to International Olympic Committee, President Thomas Bach. For the second consecutive day, a group of Kenyan athletes who were joined by the former World marathon record holder Wilson Kipsang, occupied the offices of AK, Riadha house. The athletes want the top brass of the national governing body to step down over corruption and doping cover-up allegations, a decision that was also endorsed by the Government. Bach said he had been following the developments and he was concerned with the allegations that had led the athletes to take matters into their own hands. “What I heard is that some athletes were entering the headquarters of the national Athletics Federation. This has to be taken very seriously and addressed. I will take the opportunity here to meet with the representatives of the Kenyan committee,” he said ahead of his scheduled briefing with the National Olympics Committee of Kenya Chairman Kipchoge Keino and Paul Tergat, the IOC member. 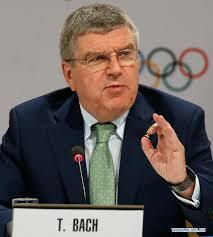 Bach is in Mauritius attending the Association of National Olympic Committees of Africa, ANOCA general assembly.